Ham Radio News: SV1BTR: EME ARRAY. 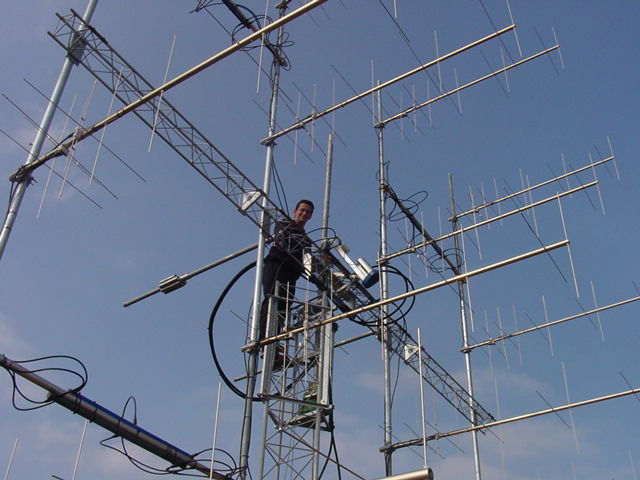 Jimmy is 38 years old and has been around on 2m and 70cm EME since 1993. Rather than loosing interest I can say that he is more keen now than he was then. Raising a family and working hard is of course taking time from his radio hobby, but be sure, if there is some activity on the bands Jimmy is there looking for QSO's! So far Jimmy has worked >2500 QSO's on EME, in CW EME and some on SSB. Jimmy says he was the first one to use cross polarized (xpol) yagis in a 432 MHz EME array back in 1998. And in 2003 he followed up on that success by putting up the first rear mounted xpol array for 144 MHz. After a big number of single yagi stations worked, the smallest station worked on 144 MHz so far is KC3RE/p in his car, using 120W and a 15 el yagi. No, this was not JT65, it was on CW !! Quite an achievement! Living in the vicinity of the big city of Athens Jimmy has been struggling for years from 2 eme qth with his receive setup. As one can understand that there are millions of transmitters in such a large city that will put tremendous RF levels in the receiver. QRM and wind problems were among the reasons for moving his radio station outside of town, to a more remote and not as RF dense area. This has proven to be a great success as Jimmy is now knocking off one small EME station after the other on CW. Over the years Jimmy has also struggled with 13 different EME arrays. He has now settled for the impressive arrays presented below, until more antenna enhancements are expected in 2006! In the shack the amateur radio station sports 2m & 70cm LZ2US EME amplifiers, no wonder his signal is so reliable!